I am writing a cover letter and CV using moderncv. 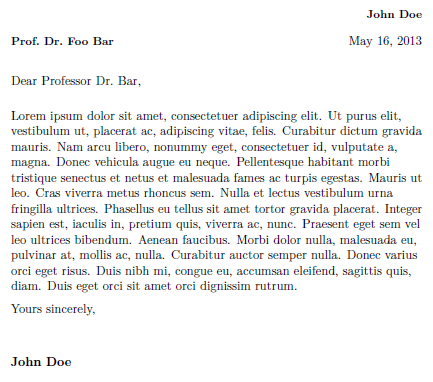 Everything works fine so far, but the text in the cover letter is not justified. I think it is good that it is not hyphenated, but it would look much nicer if the text was justified. The above patch just removes the necessary \raggedright from the template at the correct location (just before calling \@opening). Works fine for me both with classic and with casual. Note that this simply enclose the raggedright command, so it won't affect the entire document from this point onwards. You can do the same for each of the other styles. I have a not so elegant solution using \minipage. That works fine for the casual style but it should work for the other ones as well. The paragraph spacing is zero in the \minipage, so one has to restore the value so that the text spacing would be ok.
Not the answer you're looking for? Browse other questions tagged horizontal-alignment moderncv letters or ask your own question. What are penalties and which ones are defined? 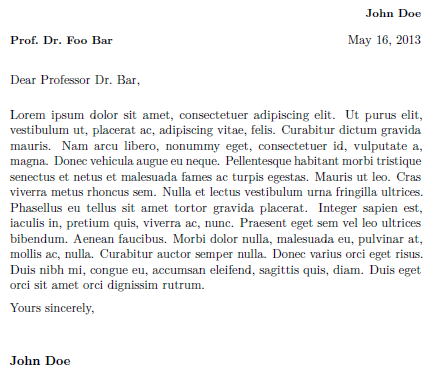 How to cut the space of the closing in moderncv cover letter?